The Olympics is the ultimate opportunity to represent your country on the world stage. Still, the honor doesn't mean that you are obligated to practice blind patriotism in the process. On Saturday, Ethiopian runner Feyisa Lilesa competed for a second place finish in the men's marathon . As he crossed the finish line, he threw up his hands in an X, which to many spectators probably seemed innocuous. But the runner was making a bold political statement, and one that could potentially get him killed back home. Rather than relishing in his silver medal finish at 2:09:54 — a redemption for the country after three of its runners failed to cross the marathon finish line — Lilesa immediately thought of the problems going on back in Ethiopia, rather than the comeback. 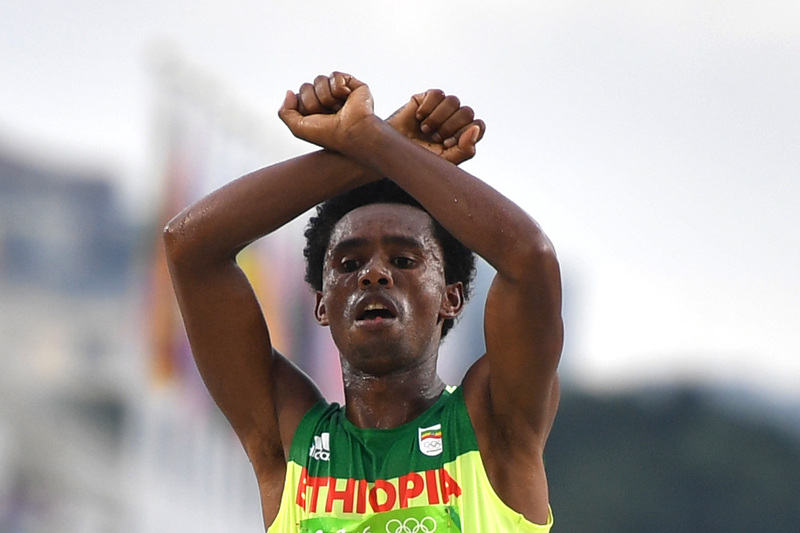 With his gesture, the 26-year-old athlete was protesting the killing of the Oromo people, an ethnic group that has long been marginalized by the Ethiopian government. The Oromo people have been using the X as a sign of solidarity. Since November 2015, the Oromo people have been protesting the proposed reallocation of Oromia, the country's largest region. Violence has often erupted as state security forces try to shut protests down. The Human Rights Watch estimated that 400 people — most of them citizens — have been killed since the protests began. The protests started in Ginchi, a small town near the capital city of Addis Ababa. A proposed investment project would use Oromo land, a decision that the largest ethnic group claims is being forced on them by the government, which is largely run by the Tigrayan ethnic group. Lilesa's simple protest, he believes, won't come without consequences. "If I go back to Ethiopia maybe they will kill me," he said in a press conference after the race, according to the Sydney Morning Herald. "If I am not killed maybe they will put me in prison." According to the Washington Post, the state broadcaster in Ethiopia did not air the replay of the finish. Still, Lilesa seemed determined to bring awareness to the plight of his people — no matter what happened afterward. "The Ethiopian government is killing my people, so I stand with all protests anywhere, as Oromo is my tribe," Lilesa said, according to the Washington Post. "My relatives are in prison and if they talk about democratic rights they are killed." Lilesa said that he is considering moving to another country after his protest. But undoubtedly for the Oromo people, Lilesa showed that you can be at once a national hero and stand up for injustices.